Situated just north of Ludlow on the A49, Ludlow Food Centre is a top notch Food Hall. With its emphasis on quality and provenance, it gives food lovers the opportunity to buy some of Shropshire’s finest produce. If you’re visiting for the Ludlow Food Festival, make sure you pop in. Ludlow has long been renowned as a hub of foodie excellence. Its annual food festival in September, attracts thousands of visitors each year and has the reputation for being the festival for serious foodies. Its Food Centre, which is part of the Earl of Plymouth’s Oakly Park Estate, opened in 2007 and has done much to build upon this great reputation. 80% of its produce is sourced from Shropshire itself or from the neighbouring counties of Worcestershire, Hereford and Powys. What makes the Food Hall even more appealing, are the 8 specialist kitchens cleverly designed so you can observe the production process as you shop. It’s guaranteed to make you fill up your shopping basket. If you’re shopping at Ludlow Food Centre in the morning, you’ll be greeted by the delicious smell of warm freshly-baked bread and cakes. At their weekly tasting sessions, the bakers invite you to step into the bakery to watch daily activities from kneading sourdough made from a 21 year-old mother dough, to decorating their speciality red velvet cakes. For anyone with a sweet tooth, the centre’s award-winning Victoria Sponge filled with Lady Windsor’s raspberry jam is simply irresistible. The jam selection will transport you back to your granny’s kitchen and nostalgic childhood summers spent fruit-picking and picnicking on delicious fruity jam sandwiches and tarts. Buy old favourites such as damson and gooseberry or more unusual flavours including wild wimberry. It’s all made in small batches using traditional methods. This year, the team are expanding their range to include lime and blackcurrant curds, the perfect addition to a homemade fruity pavlova or a creamy roulade. Unlike many other food centres, all the meat at Ludlow comes from one source – The Earl of Plymouth’s nearby Oakly Estate. The abattoir is located nearby so the animals are all reared, slaughtered, butchered, hung and sold within a 6 mile radius. In the butcher’s cold room, you’ll see freshly-killed pigs from the estate’s herd of Gloucester Old Spots and massive sides of beef, ageing the proper way, hanging on the bone, rather than divided into cuts and sitting in vacuum packs. There’s seasonal game too including pheasant, partridge and venison. Cheese enthusiasts can watch the resident cheese-maker creating one of seven different kinds of cheese including the only true Shropshire Blue made in the county. Cultural Foodies will make a beeline for a Stilton-styled cheese called ‘Remembered Hills’ in reference to Houseman’s “blue remembered hills” from A Shropshire Lad. Try it with Lady Windsor’s spiced chutney. 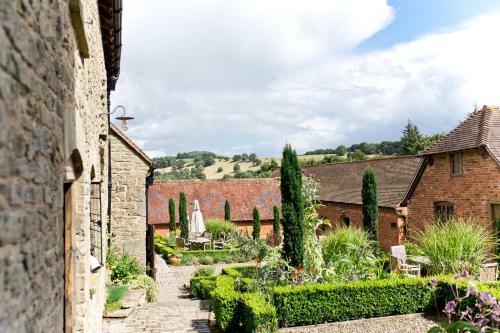 Near Shrewsbury, The Inn At Grinshill is surrounded by beautiful Shropshire countryside. Rooms from £53 a night. Drapers Hall offers 5-star, luxury rooms and a contemporary restaurant in Shrewsbury. Please check with the Ludlow Food Centre directly. Find more Foodie Things To Do in Shropshire. Discover Britain’s best Farm Restaurants and Farm Shop Cafés.